A great shot taken by one of the race volunteers. A beautiful day and course, indeed. I signed up for this one as my 50K for April, one race in a line of "local" monthly 50k-50M races I put on my calendar in training for the Pinhoti 100 Miler in November. I ran this race for the first and only time three years ago, long before I had my "health issues". Since I consider everything prior to Pinhoti 100 in November a training race, actual racing isn't really on my mind, but I have been noticing that I've steadily been getting faster since puttin' on my ultra running shoes again earlier this year. My initial thoughts of "wow, I'm just glad to be out here running ultras again, DFL or not" have slowly turned into "$h!t, I might actually be getting faster than I was before my reconstructive ankle surgery, multiple DVTs and bilateral pulmonary emboli, yeah buddy!" So while I am keeping those things in mind, it has been feeling great to see some improvement. Of course, these things didn't happen on their own. If you know me even just a little, especially if that little is usually through Facebook, then you know that I'm a bit of an oversharer when it comes to the things I do. However, I did not post my most recent health and fitness goals publicly, because I have struggled in the past to really follow through with those same goals. While I could use my inability to be as active as I wanted to the past year as an excuse for my gain in weight, in all honesty, it was more related to my chocolate, gummi bear and anything high in carbs in general addiction. Why do I call it an addiction? Because I wouldn't go a single day without munching on either of those. When it was all said and done, I had gained 20 lbs and my body fat was pretty high as well. So I turned to what I call clean eating; no empty carbs, no sodas, no candy, no fast food, no fried food. I'm not really dieting, I just cleaned up my eating and I am watching my net caloric intake. And the results speak for themselves. I have dropped almost 20 lbs over the last 50 days and close to 30 lbs since early January. I actually hadn't seen my weight this low since my senior year in high school and my body fat is getting veeery close to single digits. I can't wait to get my annual blood work done to see the impact, if any, on the usual culprits of bad news. While I have never been in any real danger of high blood pressure or high cholesterol, they have been a little too high for my personal comfort in the past considering my life long levels of physical activity. However, I never ever watched my diet, so this will be an interesting experiment. But enough about this, let's talk about the Sweet H2O 50K, one of the harder 50Ks in the Southeast for sure. I got up at 5AM on race day, drank my mandatory cup of Joe, took care of the necessities and headed out to Sweetwater Creek State Park in Lithia Springs just outside of Atlanta. I thought I'd be one of the first peeps to arrive, but I was wrong. The parking lot was alreadt plenty busy and lots of runners milling around in the early morning darkness. Volunteers were directing traffic efficiently and I parked within 2 minutes of arriving at the park. I decided to head to the race headquarters (main pavilion, a closed building with an actual bathroom) and pick up my race packet before heading back to my car to get ready. Coming down from the gas line section towards the end of the loop. The first change occurred right after the race start. 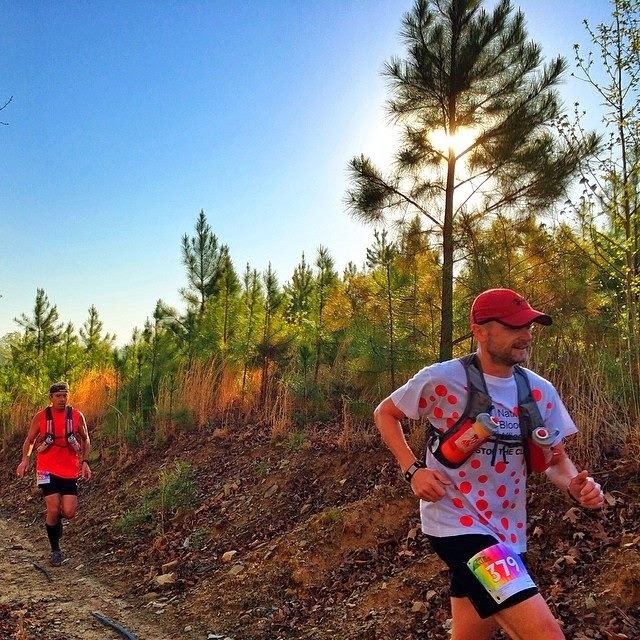 In previous years, runners had about 2 miles or so to run on the road and to jockey for position before entering single track trail. This year, we had .5 miles to get were we wanted to end up in the Conga line before entering a short "bushwacking" section and single track trail. Since my training had been going well and since I wanted to have more as a goal than just finishing, I decided that I wanted to try to either finish top 20 or in under 6 hours. So when we took off from the start, I made sure to count of the runners ahead of me and to slide in somewhere in 20-25th position. It turned out I would stay in that spot for most of the day. After a half mile of road running, we entered a rough trail section along the lake. It was actually pretty nice, just not very runable. I had checked out the elevation profile from 3 years earlier and from the looks of it, there would be lots of hills and serious ups and downs. So when I kept running at a much faster than planned pace, I kept wondering when those hills would start. We had passed the "creek crossing" after about 2 miles into the race, but we wouldn't actually cross the creek until the second loop. I distinctly remember that I had been running for almost 8 miles without walking a single section. Wow, at this pace, I am going to blow my goal out of the water, I thought. I felt pretty confident. Oh oh, that should have been a sign, but somehow I never remember those things from previous races. Anyway, I continued to move well and ahead of schedule. We finally started to hit some hills giving me an excuse to speed hike a bit and get some fluids. A continued to run. And then we hit the gas lines. Oh what fun. Actually, I didn't mind it too much...yet. Then we entered the new section of very hilly jeep road, which was nicely covered in soft wood pine chips or whatever you'd call that. It was really soft and almost springy. It felt pretty good. I had been running on my own for the most part until this section, where I finally caught up to Joel Tapley, who introduced me to Spurgeon Hendrick running right along side him. What alucky coincidence, Spurgeon's brother Shar (a fellow Huntsville runner, in case you somehow did not know;-) had actually asked me to say hello to him up while I was out here running. It is a small world indeed as I had previously seen Spurgeon's posts on the Ultralist, but I had never met him in person. Both Joel and Spurgeon were running rather well, while I started to feel the impact of the continuous ups and downs. The course had turned from "oh this is not so bad" to "aw man, I'm really supposed to do this twice?" When we all finally arrived at the out & back aid station, I was glad to take a short break in the shade while filling up my two bottles. I was starting to go through two bottles easy between aid stations and I was now taking 2 SCaps every 45 minutes. The day was warming up quickly and the humidity showed it's ugly mug as well. My sweat rate was extremely high and I had no desire to crash and burn because of dehydration, lack of fitness? sure, no problem, but not because of something that I can control within the race. No sir! So I continued on that schedule and it worked for me. Throughout the day, I only use 2 honey stinger gels, 2 bananas, a couple of orange slices and an ice-cold popsicle, that gave me an oh so nice brain freeze. I had started to slow down a bit, but I was still well on schedule for my sub 6 hour goal, or so I thought. I completed the first loop (exactly 15.5 miles or 25K) in 2 hours 45 minutes, which would give me 3 hours 14 minutes to break 6 hours, which is almost 30 minutes extra on the second loop. Oh yeah, easy-peasy, I thought. As I passed the you guy with the bullhorn cheering runners on, I remember him yelling "just 2 miles until the creek crossing". Awesome, I thought. I'm about ready for a nice cooldown in the creek. My legs will love it. Just as promised, we arrived at the creek crossing, this time not passing it but rather grabbing one of the ropes that were strung across the creek before entering the water and actually crossing it. While the water generally stayed just above my waist, there were a couple of moments when you could and would slip with the water rising to your chest, so the two rescue divers that were in the creek at all times were probably a good idea. I wasn't really sure what to expect from the course once we crossed the creek. Did we just come right back? Would we cross an adjacent bridge? Those questions were answered when someone informed me that we had a challenging 2.5 mile loop to complete before returning and crossing the creek for a second time. It was a challenging loop indeed, some climbing some fast running, but also very pretty. Once we returned to the creek, I was ready for another cool off. But I also started to wonder, where were they going to cut off 2.5 miles from the second loop. They had to somewhere, right? Surely. Otherwise, this course would be about 3 miles long and that doesn't happen, right? So I kept thinking to myself, they probably cut off a section near the finish line. But as I continued my race, I slowly came to realize that there is a very good possibility that this race is just going to be long. That also meant that there was no way that I would break 6 hours on this course, not at my current pace and there was no way I was going to run a negative split on my second loop, no way Jose! That realization made me slow down even more as soon as we hit the first hills on the second loop. What had felt like flat runable terrain on the first loop now looked like it was worthy of a speed hike...so I did just that. Just after I hit the gas lines the second time, I started to catch up to Joel again, who I thought was long gone. I also noticed on the out and back section that the lead runners were passing me in the opposite direction at around the same time they had done so on loop one. That meant they (or at least some of them) were slowing down, too. Ok, I thought, I might not hit sub 6, but maybe top 25 is still in the cards? 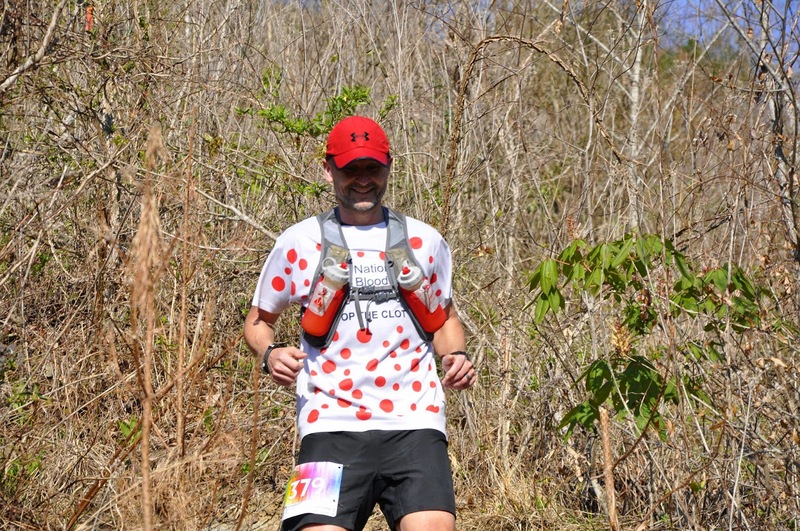 I continued to run whenever I could and I separated myself from Joel just after the out & back aid station. I had caught a second wind, briefly. I now entered the gas lines, a short but brutal section of ups and downs that put the power lines to shame. I kept moving well, or so I thought, until Joel and Brooke (?) passed me and left me in the dust. That really hurt me mentally, I thought I was moving and here they passed me like I was standing still. Alright, forget about it and keep on moving. When I finally arrived at the last aid station before the finish, I had a quick chat with the fellas that were manning the station. Their positive vibe definitely cheered me up a bit. And what one of the guys said next, really made me perk up. "Looks like there are still at least about 100 runners behind you". What? How many runners are ahead of me, I wondered. "Looks like you might be in the top 20, if I'm counting right." Say what?!? I gotta go! Thanks boys. I took off, Joel and Brooke couldn't be too far ahead, so maybe I can try to catch them again. I kept a steady pace, I figured I can keep it together for another 3-4 miles. And I did. I finally caught up to Joel, Brooke and another runner who looked like he was struggling with the heat with about 1.5 miles to go. Joel and Brooke passed the other runner and shortly after, I made my move. I always feel kinda weird passing anyone with a mile or so to go in any race distance, especially ultras, but at the end of the day, it is a race. 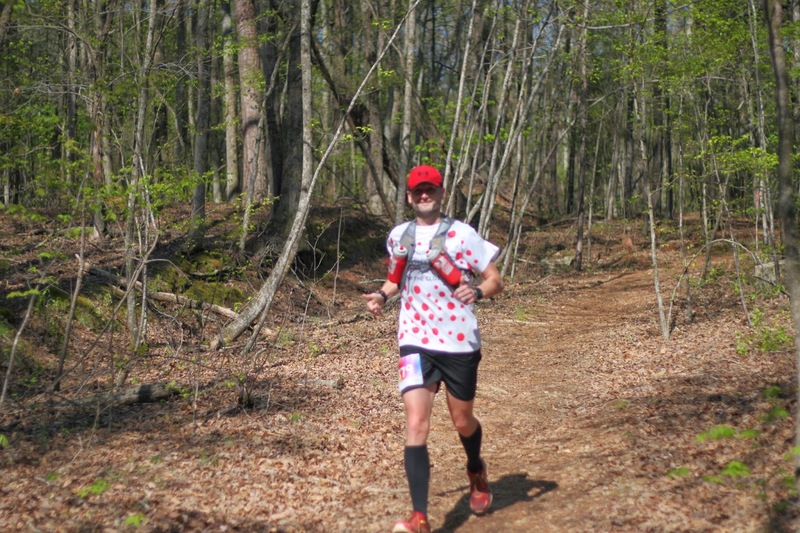 Do I stop for other runners in distress? Always! But I also am competitive by nature. The fact that I had missed out on a few top 20 finishes just because I decided not to push in the final half mile of a race really made me push this time. I wondered, what if this guy is in the 20th spot? So I pushed hard...pushed past him quickly and continued to push. I didn't want him to change his mind and suddenly start running or chasing after me:-) With a half mile to go, I caught up to Joel and Brooke. I was laboring hard at this point, but I was moving faster than them, so I decided on one more push. Surely, the finish line must be right around the corner, right? It wasn't, but as I started to slow and resigned to the fact that they would probably come back and pass me again, I finally spotted some spectators. Surely, that must be it. That must be the finish line. Alright, one last push and let's just see how I did. I crossed the finish line in 6 hours 54 minutes, much slower than I had hoped, but not bad for just over 34 miles on a hot and humid day with no less than 5000 feet of elevation gain alone. When the RD handed me my finisher's card and hat, I was ecstatic, 18th place overall out of 140 starters. One of the new sections of the course, I believe.